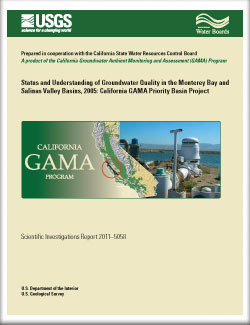 Groundwater quality in the approximately 1,000 square mile (2,590 km2) Monterey Bay and Salinas Valley Basins (MS) study unit was investigated as part of the Priority Basin Project of the Groundwater Ambient Monitoring and Assessment (GAMA) Program. The study unit is located in central California in Monterey, Santa Cruz, and San Luis Obispo Counties. The GAMA Priority Basin Project is being conducted by the California State Water Resources Control Board in collaboration with the U.S. Geological Survey (USGS) and the Lawrence Livermore National Laboratory. The GAMA MS study was designed to provide a spatially unbiased assessment of the quality of untreated (raw) groundwater in the primary aquifer systems (hereinafter referred to as primary aquifers). The assessment is based on water-quality and ancillary data collected in 2005 by the USGS from 97 wells and on water-quality data from the California Department of Public Health (CDPH) database. The primary aquifers were defined by the depth intervals of the wells listed in the CDPH database for the MS study unit. The quality of groundwater in the primary aquifers may be different from that in the shallower or deeper water-bearing zones; shallow groundwater may be more vulnerable to surficial contamination. The first component of this study, the status of the current quality of the groundwater resource, was assessed by using data from samples analyzed for volatile organic compounds (VOC), pesticides, and naturally occurring inorganic constituents, such as major ions and trace elements. This status assessment is intended to characterize the quality of groundwater resources in the primary aquifers of the MS study unit, not the treated drinking water delivered to consumers by water purveyors. Relative-concentrations (sample concentration divided by the health- or aesthetic-based benchmark concentration) were used for evaluating groundwater quality for those constituents that have Federal and (or) California regulatory or non-regulatory benchmarks for drinking-water quality. A relative-concentration greater than (>) 1.0 indicates a concentration greater than a benchmark, and less than or equal to (≤) 1.0 indicates a concentration less than or equal to a benchmark. Relative-concentrations of organic and special interest constituents [perchlorate, N-nitrosodimethylamine (NDMA), and 1,2,3-trichloropropane (1,2,3-TCP)], were classified as “high” (relative-concentration > 1.0), “moderate” (0.1 < relative-concentration ≤ 1.0), or “low” (relative-concentration ≤ 0.1). Relative-concentrations of inorganic constituents were classified as “high” (relative-concentration > 1.0), “moderate” (0.5 < relative-concentration ≤ 1.0), or “low” (relative-concentration ≤ 0.5). Aquifer-scale proportion was used as the primary metric in the status assessment for evaluating regional-scale groundwater quality. High aquifer-scale proportion was defined as the percentage of the area of the primary aquifers with a relative-concentration greater than 1.0 for a particular constituent or class of constituents; percentage is based on an areal rather than a volumetric basis. Moderate and low aquifer-scale proportions were defined as the percentage of the primary aquifers with moderate and low relative-concentrations, respectively. Two statistical approaches—grid-based and spatially weighted—were used to evaluate aquifer-scale proportions for individual constituents and classes of constituents. Grid-based and spatially-weighted estimates were comparable in the MS study unit (within 90-percent confidence intervals). Inorganic constituents with human-health benchmarks were detected at high relative-concentrations in 14.5 percent of the primary aquifers, moderate in 35.5 percent, and low in 50.0 percent. High aquifer-scale proportion of inorganic constituents primarily reflected high aquifer-scale proportions of nitrate (7.9 percent), molybdenum (2.9 percent), arsenic (2.8 percent), boron (1.9 percent), and gross alpha-beta radioactivity (1.5 percent). Relative-concentrations of organic constituents (one or more) were high in 0.2 percent, moderate in 6.6 percent, and low in 93.2 percent (not detected in 48.1 percent) of the primary aquifers. The high aquifer-scale proportion of organic constituents primarily reflected high aquifer-scale proportions of tetrachloroethene (0.1 percent) and methyl tert-butyl ether (0.1 percent). Relative-concentration for inorganic constituents with secondary maximum contaminant levels, manganese, total dissolved solids, iron, sulfate, and chloride were high in 18.6, 8.6, 7.1, 2.9, and 1.4 percent of the primary aquifers, respectively. Of the 205 organic and special-interest constituents analyzed, 32 constituents were detected. One organic constituent, the herbicide simazine, was frequently detected (in 10 percent or more of samples), but was detected at low relative-concentrations. The second component of this study, the understanding assessment, identified the natural and human factors that affect groundwater quality by evaluating land use, physical characteristics of the wells, and geochemical conditions of the aquifer. Results from these evaluations were used to explain the occurrence and distribution of constituents in the study unit. The understanding assessment indicated that most wells that contained nitrate were classified as being in agricultural land-use areas, and depths to the top of perforations in most of the wells were less than 350 ft (76 m). High and moderate relative-concentrations of arsenic may be attributed to reductive dissolution of manganese or iron oxides, or to desorption or inhibition of arsenic sorption under alkaline conditions. Arsenic concentrations increased with increasing groundwater depth and residence time (age). Simazine was detected more often in groundwater from wells with surrounding land use classified as agricultural or urban, and with top of perforation depths less than 200 ft (61 m), than in groundwater from wells with natural land use or with deeper depths. Tritium, helium-isotope, and carbon-14 data were used to classify the predominant age of groundwater samples into three categories: modern (water that has entered the aquifer since 1953), pre-modern (water that entered the aquifer prior to 1953 to tens of thousands of years ago), and mixed (mixtures of modern- and pre-modern-age waters). Arsenic concentrations were significantly greater in groundwater with pre-modern age classification than in groundwater with modern-age classification, suggesting that arsenic accumulates with groundwater residence time. Kulongoski, J.T., and Belitz, Kenneth, 2011, Status and understanding of groundwater quality in the Monterey Bay and Salinas Valley Basins, 2005—California GAMA Priority Basin Project: U.S. Geological Survey Scientific Investigations Report 2011–5058, 84 p.